The Associated Press The Pirates’ Jason Martin, Starling Marte and JB Shuck celebrate the win in Chicago. 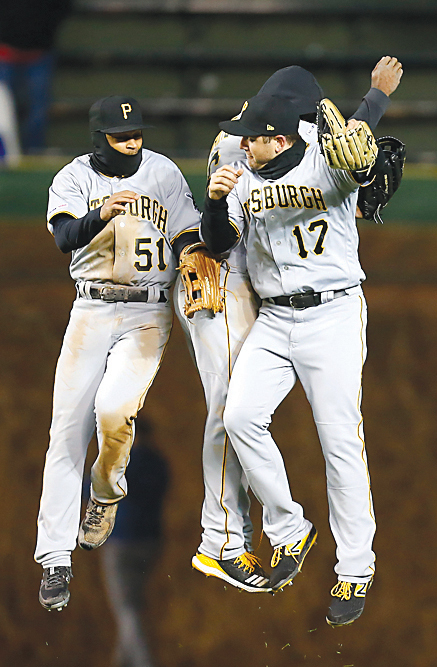 CHICAGO — Jordan Lyles struck out 10 in crisp six innings to tie a career high, Francisco Cervelli and Starling Marte homered off Yu Darvish, and the Pittsburgh Pirates topped the Chicago Cubs, 5-2, on Wednesday night. Lyles (1-0) allowed three hits and was sharp again in his second start, with Jason Heyward’s solo shot in the fifth accounting for the lone run against him. The right-hander walked only one as Pittsburgh bounced back from a 10-0 drubbing in the Cubs’ home opener Monday to win for the fifth time in six games. Heyward had three hits and Javier Baez drove in run with a double in the eighth, but Felipe Vazquez got the final five outs for his third save in as many chances. Darvish (0-2) and the Cubs (3-8) continued to struggle on a 40-degree night at Wrigley Field with the wind blowing in from center field at 20 mph. Darvish allowed five runs — four earned — and five hits in 5 1/3 innings in his first start at home since May 2, 2018. But the right-hander walked none and struck out four after issuing 11 walks over 6 2/3 innings in his first two outings. Darvish signed a six-year, $126 million contract with the Cubs before the 2018 season, but he made it through only eight starts before being shut down with right triceps tendinitis on May 26. Cervelli lined a homer to left-center in the first to put the Pirates ahead 1-0. Marte turned on a fastball and lofted a two-run shot down the left-field line in the third to make it 3-0. Heyward’s drive in the fourth cut it to 3-1 and reached the edge of the center-field shrubs despite the steady incoming wind. The Pirates tacked on two runs and chased Darvish in the sixth. Josh Bell had an RBI single off reliever Kyle Ryan, and Cervelli came home on Ryan’s errant pick-off to first. RHP Chris Archer is still scheduled to start Saturday against Washington as he awaits a ruling on his appeal of a five-game suspension, manager Clint Hurdle said. Archer received the penalty for his part in a bench-clearing fracas last weekend against Cincinnati at PNC Park. Pirates: RHP Jameson Taillon, hit in the head by Anthony Rizzo’s comebacker on Monday, does not have a concussion. Hurdle said Taillon “met all the criteria for the check-ups.” … OF Lonnie Chisenhall (fractured right hand) took batting practice in the indoor cage on Wednesday and is playing catch. … OF Corey Dickerson (right posterior shoulder strain) has resumed batting practice, but is not yet cleared to throw. … C Elias Diaz (virus) played Tuesday and Wednesday night for Triple-A Indianapolis. Cubs: LHP Jon Lester was put on the 10-day injured list (strained left hamstring) retroactive to Tuesday. Injured while scoring from second base on Ben Zobrist’s single in Monday’s home opener, the Cubs ace will miss at least one turn. LHP Tim Collins was recalled from Triple-A Iowa and pitched the ninth. Pirates RHP Joe Musgrove (1-0, 0.00) faces Cubs LHP Jose Quintana (0-1, 10.29) in the series finale tonight. Musgrove tossed seven scoreless innings and won his first start last Friday against Cincinnati. Quintana was hammered for eight runs, including three homers, in three innings Friday at Milwaukee. Are Red Sox in trouble? Mueller report changes few minds in Washington, D.C.